BOSTON - With all of the scoring being mustered by these two teams throughout the postseason, did you honestly expect it to continue in the game which mattered most? As bountiful as the offenses for Woburn and Methuen/Tewksbury have been in previous playoff affairs, Sunday's Division 1 final at TD Garden proved to be a defensive, tightly-fisted showcase with little room for error on either side. After 45 minutes of up and down play, only one shot found its way into the back of the net. That belonging to Kaitlyn Delaney. Left alone in the high slot, the senior took a behind the net feed from Marissa Gregory and promptly sent a shot past Red Ranger goaltender Kaia Hollingsworth at 6:31 of the second period. The goal would hold up, giving the Tanners a 1-0 victory, and their second state title in as many years. "I think at the start everyone was trying to feel each other out and, with the intensity of this game, everyone was playing tight," said Tanners coach Bob MacCurtain. "We knew we needed to play good coverage in our own end because (Methuen/Tewksbury) is a very good team. We got some great goaltending by Amanda Essigmann. Obviously it all starts there. These girls never seemed fazed by any of the big moments they were in during the playoffs." No. 2 Woburn capped off its brilliant season, going 24-0-2. The Tanners are now 29-0-3 since February 18th of last year. The win also marked the program's fourth state crown since its inception in 2000. Following a lackluster opening period in which neither team managed to generate much, things started to pick up steam in the middle frame. Showing its aggressiveness, Woburn began the period by working the puck fluently inside the Red Rangers' zone. However, some solid play between the pipes by Hollingsworth, a sophomore who finished with 18 saves, doing everything she could to keep things scoreless. "Things just didn't bounce our way tonight," Hollingsworth said. "We played our hardest and really worked for this moment. Making it to the Garden, there are just two teams out of every single Division 1 girls program in the state so that's pretty special. Yes, we lost but I think this is just the beginning for us. Next year I feel we can come back and be even stronger." The Red Rangers return all but four players to begin next season. During the middle period, Methuen/Tewksbury had three power play chances but failed to convert on any of them which would come back to haunt them. As things progressed in the frame, an errant Red Rangers pass, from inside its own defensive zone, was intercepted by Cassidy Connolly along the left wall. Cassidy pushed the puck over to Gregory, positioned inside the trapezoid. Gregory quickly spotted Delaney all by her lonesome, moving towards the net. The forward wasted no time ripping a shot past Hollingsworth's blocker. "(Methuen/Tewksbury) played really well," said Delaney. "The thing is that we work as a team and try to keep each other on task. We don't try to do individual work. Passing has been the key for us. On that goal I knew I needed to get open for my teammates. I was there for them and they were there for me. Marissa made that perfect pass over to me and I was able to finish. It has been an amazing experience here. It's really nice to represent Woburn the way we did." The fourth-seeded Red Rangers (22-2-2) had opportunities late in the period to knot things. However, the Tanners defense remained up for the challenge, blocking several perimeter chances which carried into the final period. In the third, Woburn built a fortress around Essigmann, a sophomore who stopped all 14 shots face. 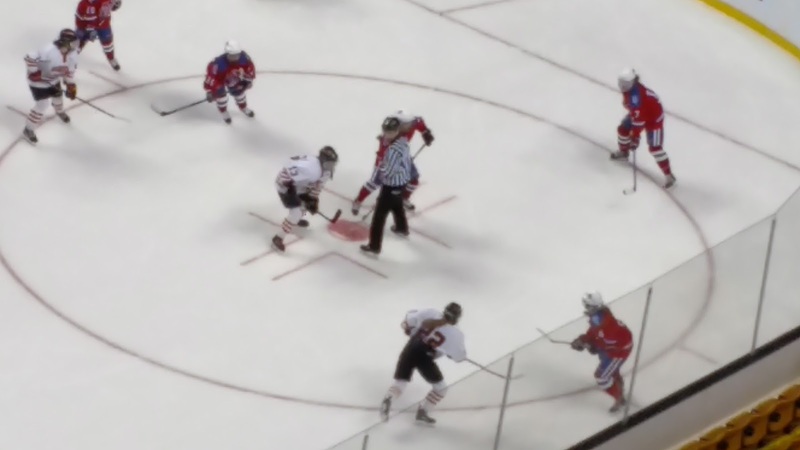 The defense never allowed the Red Rangers to penetrate from the between two circles to the crease area. With this win, the Tanners, during their playoff run, have outscored the opposition 19-3. Methuen/Tewksbury, playing in its first championship tilt, was equally as formidable, finding the back of the net 14 times the past two weeks, while allowing only six markers. With Woburn keeping its collective focus on the defensive end throughout the latter stages, the Red Rangers turned up the heat early in the frame and later in the closing minutes. At times, Methuen/Tewksbury, when shots were not being blocked, found itself holding onto the puck too long. That allowed the Tanners to poke check the puck away and keep the Red Rangers off-stride. "They did a great job packing things in, in front of their goalie," said Red Rangers coach Sarah Oteri. "We had some good scoring opportunities. In the third period we were flying and controlling the puck. We did everything we had to do in that period to get one by (Essigmann) and we just couldn't. I'm proud of our girls' effort all game and throughout this season."